The colorful Indian Weddings need a lot of decoration and props to make them lively and pompous. We supply all types of Indian decoration items like, decorated Rickshaw, Decorated Redi, Aluminum Kettles, Pickle Jars, Woven Wooden Cots, Bird Cages, Tea Glasses and holders, Mirror frames, fiber glass Paisleys and many more decoration Stuff. 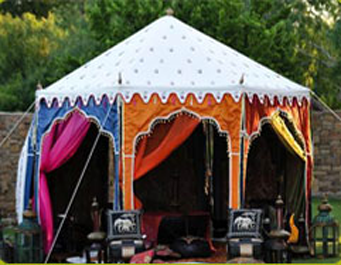 We provide Mehndi seating, with mattresses and bolsters, be it your Lady’s Sangeet, “Mehndi Night or Hookah Party the floor seating is always a hit ! The traditional Pickle Jars, Painted Kettles and Bird Cages are used as Flower Vases. 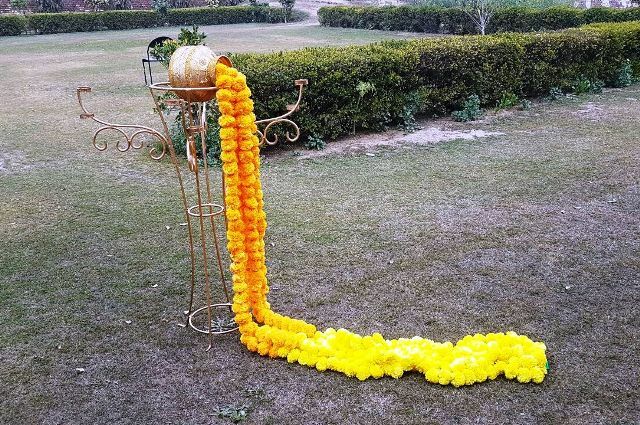 We also supply artificial flowers and flower torans for wedding mandaps at Indian Weddings and Pooja functions. Artificial Roses, Marigold, Jasmine, Orchids and Green leaves are very popular. Beautiful Indian block prints are used to make very fancy and attractive looking fabric buntings. We also make buntings of colorful dots, checks & stripes. These can be used to decorate your tent for a birthday party and later on to accessorize your child’s bedroom. We also make buntings of nursery prints for kid’s rooms and play area. Party buntings are made in raw silk fabric and give a very special touch to your special event. You can pick your own colors from solid color buntings to printed fabric buntings, we make them all !! !